For quickly and easily scanning 35mm film in multi-frame batches, the PowerSlide X unit from Pacific Image is just what you need. It features a fantastic optical resolution, great color depth, and everything else you need to create high-quality digital scans of your film photos. To get the incredible 10,000 dpi resolution when scanning, a combination of factors give this unit an edge. Color control and contrast are aided by a 48-bit color depth, ensuring top-of-the-line tint and saturation accuracy. Multipass Xposure, a proprietary piece of technology from Pacific Image, scans each slide or frame three separate times to gain the most image information possible, making the most of film's naturally high dynamic range and improving sharpness and accuracy. 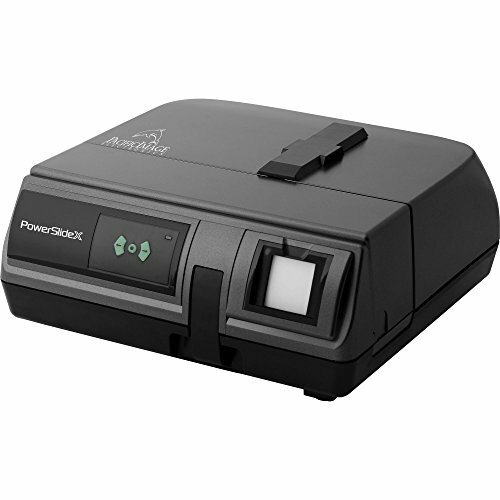 The scanner's magazine feeder is capable of holding up to 50 slides at a time, making it easy to batch-scan, and the connection interface of the scanner is a simple USB cord for simple use with either a Mac or Windows computer.